The electronic spreadsheet is among the top five most important advances in business management to come along in the last hundred years. It revolutionized almost all aspects of running an organization. It was the original “killer app” that made it necessary for people to go out and buy a personal computer. Yet our recent benchmark research project Spreadsheet Use in Today’s Enterprise confirmed advice we have been giving for the past decade: Spreadsheets are a fabulous tool but they have limits, and those who fail to respect those limits wind up paying a price. The consequences may be obvious, as JP Morgan found when faulty spreadsheets used by its trading desk cost it dearly. Or it may be more subtle, as with all the time people waste trying to make spreadsheets do things they were never designed to do. The research found that desktop spreadsheet users routinely encounter problems. For example, errors are common in spreadsheets across data, formula and format areas as found in a large number of organizations according to our research. The consequences are most material when they are part of a core business process. Nearly half (46%) said they find errors in data frequently or occasionally in the most important processes where they use spreadsheets. Another 34 percent find errors in formulas in their most important processes. 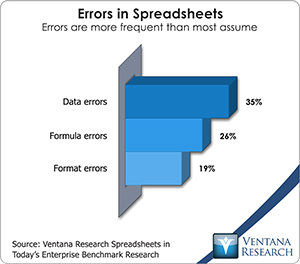 Multiple versions of the same spreadsheet can be an issue if the versions do not agree with one another (a condition referred to as “dueling spreadsheets”); 43 percent said this happens frequently or all of the time, and one-third (31%) find it happening for the most important process that uses spreadsheets. Problems such as data errors or conflicting information can result from using spreadsheets in collaborative processes. One-third (34%) said that happens frequently or occasionally, and these issues stretch out the time to complete the process. Despite these flaws, we found that participants are not especially concerned about these issues. It appears that organizations have become inured to the flaws in spreadsheets because they seem to believe that, like the weather, you can complain about these issues but you can’t do much to change the situation. Errors in spreadsheets are common and may remain in place even when the spreadsheets are checked and, indeed, audited. Yet few of our participants (even the most experienced and proficient users) said they do rigorous checking to ensure accuracy of the data; half do checking only when something doesn’t look right, and when they do check they look only at selected cells. This likely is another reason why most people see no impact on their productivity from problems in spreadsheets: They simply don’t spend a lot of time checking for errors. It also may explain why mistakes have a limited impact on businesses – even the selective “eyeballing” method of checking for accuracy is likely to spot many of the blatant mistakes that would have a significant impact on business. We found other nagging issues. One-fourth of participants said that out-of-date information appears frequently in spreadsheets that support important business processes. This issue is greater in larger companies: almost half (47%) of those from organizations with more than 10,000 employees indicated it happens frequently. This points to the importance of ensuring that data is fresh and timely. When it comes to resolving issues about what is in a spreadsheet, 34 percent go back and forth resolving an issue at least occasionally, stretching out the time it takes to complete a process. Organizations routinely use spreadsheets to collect data for use in collaborative processes, and two-thirds use spreadsheets to collaborate with people outside the company. Data collection usually requires combining (rolling up) multiple files into a consolidated, aggregated view. Most (81%) of the participants and 88 percent of heavy users have to combine data from two or more spreadsheets (often from multiple contributors) to perform some business process. 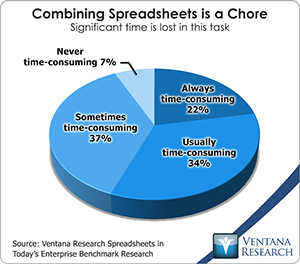 Regardless of their skill level or number of years using spreadsheets, 56 percent said that combining spreadsheets is a time-consuming chore. In the past people had to live with these shortcomings, but today businesses have options that can embrace and extend or complement them in what we have classified as enterprise spreadsheets. These options enable organizations to have the best of both worlds, allowing people to continue working in a familiar environment but without the drawbacks that spreadsheets impose when they are used improperly. Many applications use Excel just as the interface – giving people a familiar look and feel while addressing key technological shortcomings that make desktop spreadsheets error-prone and difficult to consolidate or roll up. Spreadsheets are also a leading reporting tool, critical for communicating results, forecasts, situations and risks. Yet when it comes to reporting, spreadsheets fall short again because they can be time-consuming to update and contain unseen errors. Today, people routinely spend time exploring application options for their smartphones but rarely spend any time getting to know software that can increase their productivity using spreadsheets. Don’t fall into this bad habit. Investigate options that give users the ease, convenience and familiarity of spreadsheets without the hassle and risk that too often goes with them.